Ben Carson arrives for meetings with President-elect Donald Trump on Dec. 12, 2016, in New York City. Updated Thursday, Jan. 12, 2017, 12:48 p.m. EST: Ben Carson sat before a Senate committee Thursday morning to make the case that he should be confirmed to lead the Department of Housing and Urban Development. Carson leaned on his upbringing growing up in inner-city Detroit and his family's need for public assistance, although they never lived in public housing, to make up for his lack of experience related to running the $47 billion agency. "I have actually in my life understood what housing insecurity was," Carson said, CNN reports. Carson added that his family was forced to move from Detroit to Boston because they had "no place to live." As such, Carson assured the committee that he understands issues facing the millions of people dependent on HUD programs. Carson also included four letters from past HUD secretaries supporting his confirmation, CNN reports. Sen. Elizabeth Warren (D-Mass.) challenged Carson's nomination. "Although you have many accomplishments in the medical field, there is relatively little in the public record that reveals how you would further HUD's mission," Warren wrote in a letter to Carson questioning the former GOP presidential candidate’s qualifications. It's Ben Carson's turn in the hot seat as the former neurosurgeon and onetime opponent of President-elect Donald Trump sits before the Senate Committee on Banking, Housing and Urban Affairs on Thursday morning in hopes of being voted head of the Department of Housing and Urban Development. Carson’s nomination was a bit of a shock after the former GOP presidential candidate noted that he didn't have experience to be considered for a Cabinet seat. According to CNN, Carson has "no government experience or expertise in housing and urban development policy, and Democrats on the Senate Banking committee are expected to question his qualifications to lead the $47 billion agency, which is charged with helping millions of poor Americans secure affordable housing." Because Carson's area of expertise is outside the realm of what's needed to do this job effectively (a trend among the majority of Trump's Cabinet selections), Carson is expected to highlight his time growing up in Detroit. Somehow, Carson believes that his Dickensian ascension from the inner city to becoming a renowned neurosurgeon will be enough to sway the committee that he can handle HUD. CNN notes that although Carson's family received food stamps, he never lived in public housing. 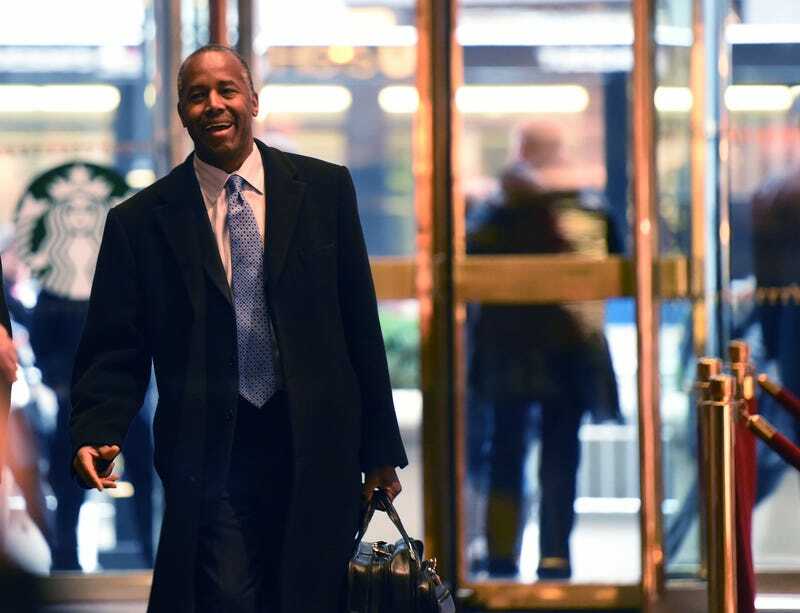 An early release of his opening statement viewed by CNN shows that Carson plans to argue that because he grew up poor, he understands the needs of those relying on HUD programs. "I understand housing insecurity—we were forced to move from Detroit to Boston to live with relatives because she couldn't afford our house," Carson says in the written statement. If Carson is confirmed, he would be the only African American in Trump's Cabinet.